I have not stopped using my Mockmill grinder since it arrived in the mail. My first project using freshly ground Sonora wheat berries was a delectable version of the New York Times plum torte. My second project didn’t turn out as well as the torte. Here I was in possession of two incredible gifts: the Mockmill grinder and sour dough starter from Karen of Karen’s Kitchen Stories. I was like a kid on Christmas morning and couldn’t wait to dive in…and I should have. 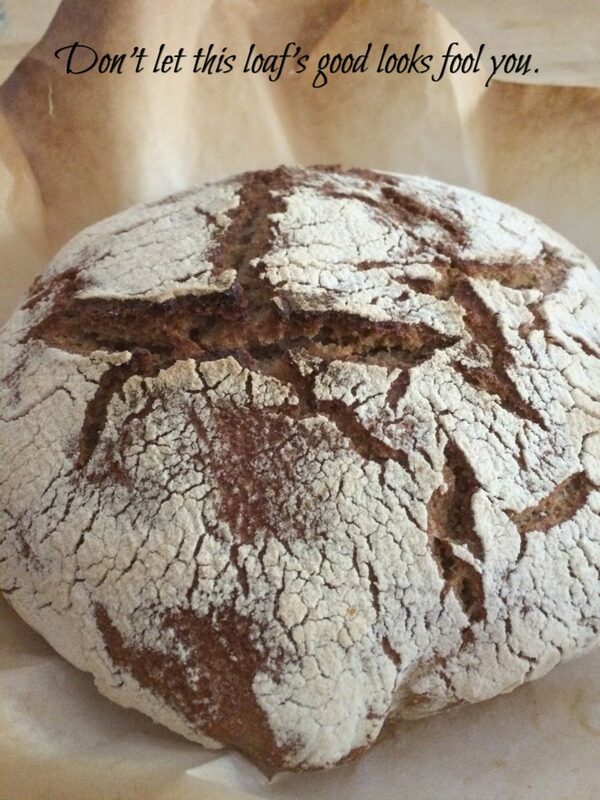 I’ve made bread before, massive amounts of bread, not sour dough with fresh ground flour, but how different could it be? I tried my best to ingest the information from The Perfect Loaf’s detailed explanation. Then I returned to Karen’s site for her much more accessible explanation. Although the bread looked beautiful on the outside it was a thick, gooey, stinky mess on the inside. My take away: #1 It might be a good to work beside an experienced sour dough bread maker.#2 Reading this post BEFORE I started my sour dough adventure might have been a good idea. Not to be deterred, I went to more familiar territory—Ciabatta. This recipe from The Kitchn is foolproof. After a bit more research I decided to divide the amount of flour between the Sonora ground wheat and King Arthur unbleached. The aroma as the rolls baked was intoxicating. The ciabatta, over the moon scrumptious. I had a friend over and we devoured almost all the rolls. 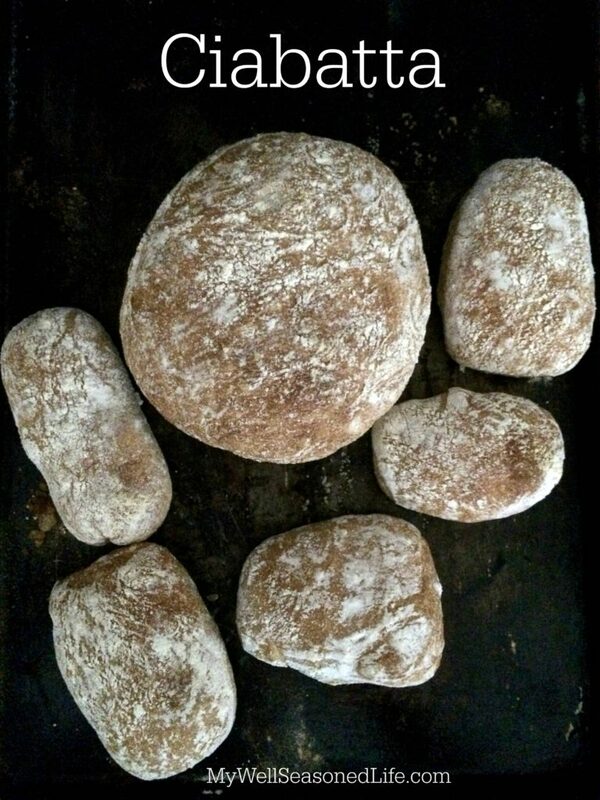 I have been baking ciabatta with Sonora wheat once a week. I’m a very happy baker who will be taking a sour dough class in the future. In a small bowl add water then sprinkle yeast on top and dissolve it. Add flour and stir. It will be soggy. Stir about 10-15 times to build up gluten. Cover and let sit out overnight or for at least 8 hours. When you awaken the starter will have bubbles. In the bowl of a stand mixer add water and dissolve yeast. Add starter and mix a bit with a spatula. It doesn't have to be completely incorporated. All both flours and salt. Stir so that it makes a wet sticky dough. Rest for 10-15 minutes so the flour can absorb the dough. Place a dough hook on your mixer and mix at medium speed for 15 or so minutes. Don't leave your mixer alone because it tends to dance along the counter or work space. As you begin the mixing process the dough will be sticking to the bowl. At about the midway point (7 or so minutes) the dough should start slapping the sides of the bowl and creeping up the dough hook. This is a good sign. When the dough starts climbing up the hook scrape it down and continue mixing for the entire 15 minutes. The dough will look shiny and fall into a puddle when you remove the hook. Cover with plastic and allow to rise 2-3 hours or until tripled. Dust your workspace with a heavy layer of flour. 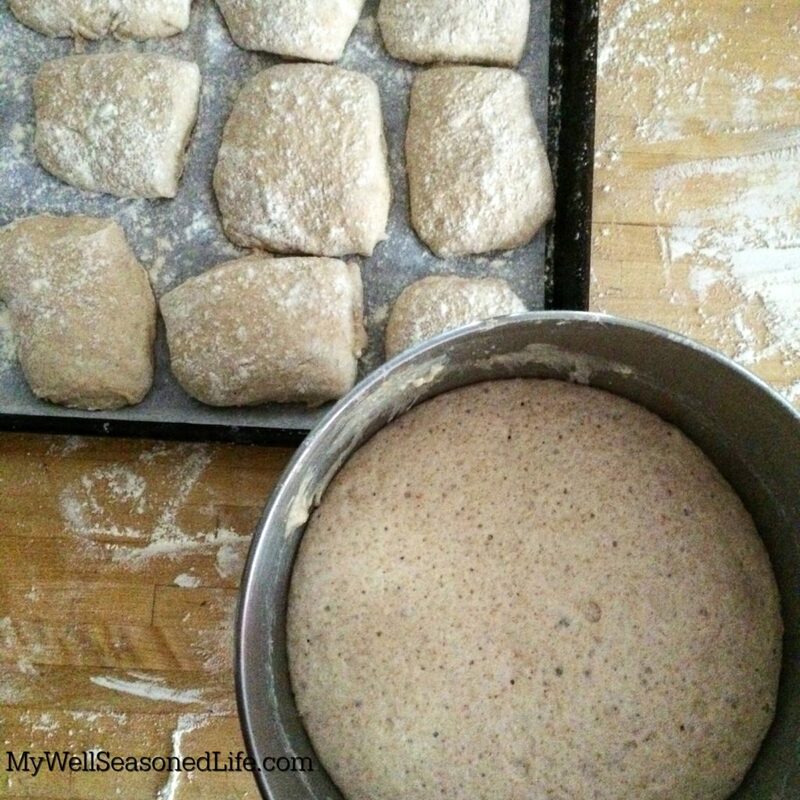 Scrap the dough onto the floured surface. Don't deflate it too much. Sprinkle more flour on top of the dough. With a bench scraper or pizza wheel cut dough in half if you want loaves. Or in sixteen pieces for rolls. Using the bench scraper or a spatula individually scrap the rolls or loaves onto the parchment paper. If the rolls don't hold their squarish shape, carefully and gently form them into shape. Let your rolls or bread rise uncovered for 30 minutes. They should puff up and have bubbles just below the surface. Place sheet pan into oven and bake for 20 minutes for rolls, 30 minutes for loaves until golden brown. Thanks to The Kitchn for this recipe. Oh my, that looks so dellicious! My mum just made these again with a mix of whole and white, this morning! Beautiful, Judy!!! Get minds think alike. 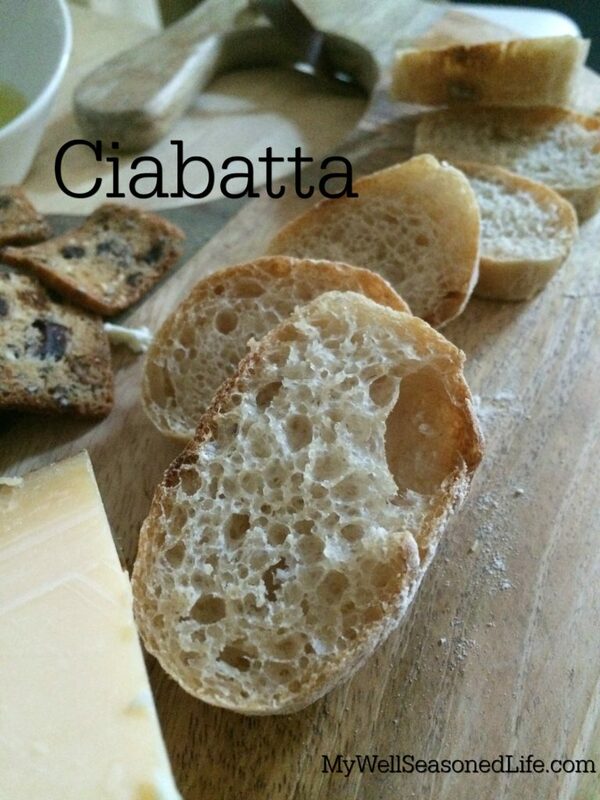 Christina, that ciabatta recipe is the best. Wow, this looks incredible. I’m familiar with sour dough, but I’be never (successfully) tried baking bread with dry yeast. Do you think fresh yeast would do the trick too?